EAST INDIAN PRINCE'S KATAR, 18TH C.
Knoll International. 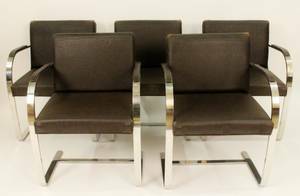 Five Knoll armchairs with chrome frames in mid-century modern style with brown upholstered backs, seats, and arm rests. 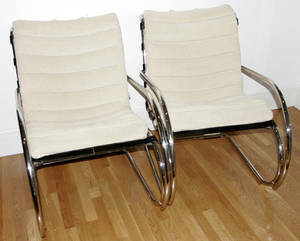 Height 32.5 inches, width (across arms) 23 inches, depth 20.25 inches. Seat to floor 18.5 inches. 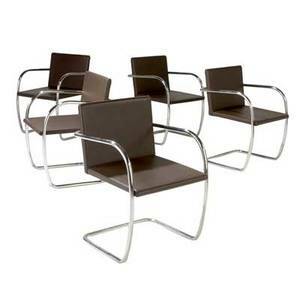 Knoll set of five tubular steel armchairs with brown leather upholstery. knoll, inc. labels. 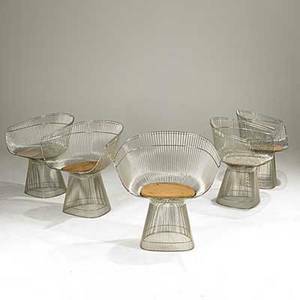 32" x 22 1/2" x 22 1/2"
Warren platner; knoll; five nickel plated armchairs; unmarked; 28 1/2" x 26" x 21"
Charles pollock; knoll international; assembled set of five rolling armchairs, new york, 1980s; chrome and enameled metal, steel, plastic and leather; manufacturers labels; 31" x 26" x 28"
Eero saarinen / knoll set of four armchairs upholstered in yellow wool on chrome-plated steel legs. 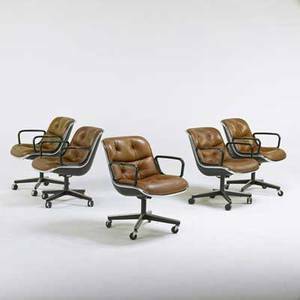 all with knoll upholstery labels. 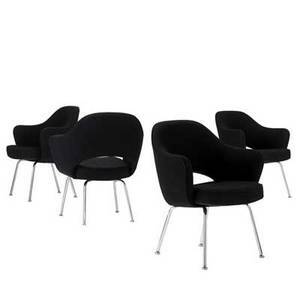 31 3/4" x 26 1/2" x 18 1/2"
Eero saarinen / knoll set of four armchairs upholstered in black wool on chrome-plated steel legs. 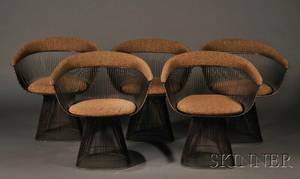 all with knoll upholstery labels. 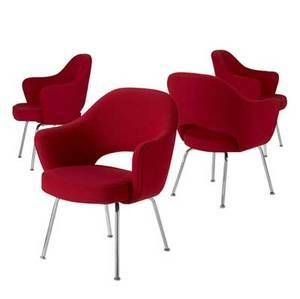 31 3/4" x 26 1/2" x 20 1/2"
Eero saarinen / knoll set of four armchairs upholstered in red wool on chrome-plated steel legs. 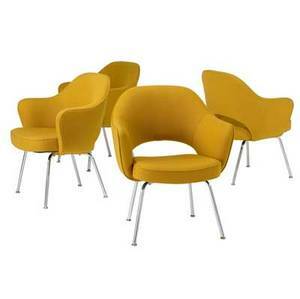 all with knoll upholstery labels. 31 3/4" x 26 1/2" x 18 1/2"